Tristram E. Speaker (April 4, 1888 - December 8, 1958), was an American baseball player. He was one of the greatest center fielders in baseball history, both on offense and defense. He had a .345 career batting average (fourth all-time), and the record for most career doubles, with 792. He played 22 seasons in Major League Baseball, with the Boston Americans/Red Sox, Cleveland Indians, Washington Senators, and Philadelphia Athletics. He also was the manager of the Indians from 1916 to 1926. Speaker was born in Hubbard, Texas on April 4, 1888. Speaker, who retired from baseball in 1928, was chosen for the National Baseball Hall of Fame in 1937. His induction ceremony was held in 1939. Speaker died of a heart attack in Lake Whitney, Texas on December 8, 1958. He was on a fishing trip with a friend when he died. 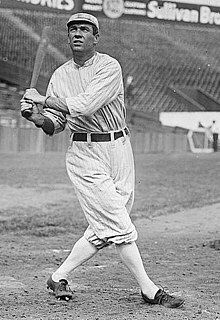 ↑ "Hall of Famers: Tris Speaker". National Baseball Hall of Fame. Retrieved 2012-12-02. ↑ "Tristram E Speaker - Induction Speech". National Baseball Hall of Fame. Retrieved 2012-12-02. ↑ "Tris Speaker Obituary". The New York Times. December 9, 1958. Retrieved 2 December 2012. Wikimedia Commons has media related to Tris Speaker. Alternative names Speaker, Tristram E.
This page was last changed on 13 April 2017, at 15:22.